I started sewing very early on, but in all the moves from high school to college, from this place to that place, I only kept one of my patterns from my high school sewing days. 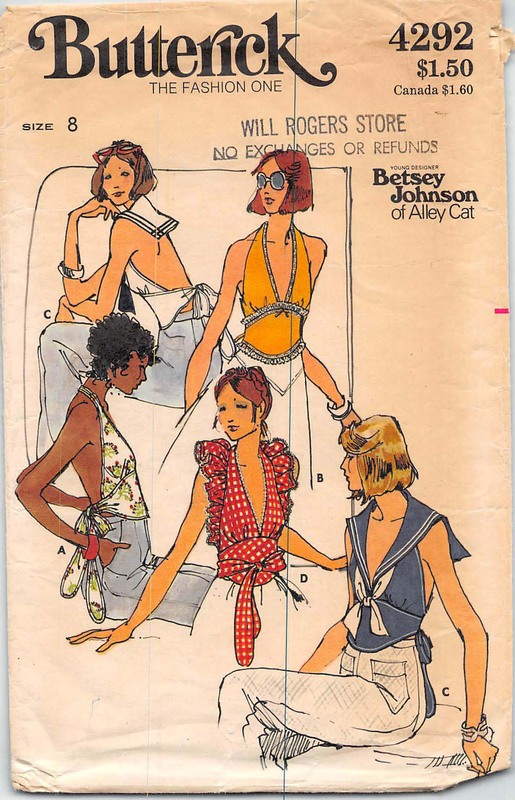 A Betsey Johnson halter top pattern. Yes, once upon a time I wore a size 8. It was during the mid to late 70’s that I started developing my own style and loved the freedom that sewing gave me to express my personality. And I could (within reason – of my mom and the school) hem my dresses as short as I wanted to ! Only a few years earlier, we had been given the right to wear pants to school-now I sound really old. I do have fond memories of the fashion of this time period: mini skirts, maxi dresses, bell bottoms, hippy and Twiggy inspired clothing. Maybe it is because I was having such fun being a teenager. Simplicity re-released a similar halter pattern, 1365. When I saw this in the pattern book I thought it was the same as my old pattern. But when I searched, I realized they were just very similar patterns from the same time period. I think I once owned the Simplicity one too. While going through my vintage patterns, I came across these two Butterick taglines from two 1950’s era patterns “It is easy to be the best dressed woman in town with the new Butterick pattern book” and “Modern sewing is easy with the very newest Butterick new sewing book” The current tagline for Butterick is “The world’s first name in sewing patterns” They have gone from targeting the “modern woman” to an expanded view of who sews. And maybe that they are the “Beyonce” of sewing – they only need one name. Maybe this interest in vintage comes from our wish to experience, or re-experience positive feelings from a by-gone era. If you like 1950’s era, follow Lauren, a fellow sewist from Austin. Her blog Rosie Wednesday http://rosiewednesday.blogspot.com/ She is a young accomplished sewist, and her personality comes through in her clothes. If you have sewn with vintage patterns, share your experience. If you haven’t yet, you should check out these tips from http://blog.caseybrowndesigns.com/2009/11/the-vintage-pattern-primer/ . Note that the reissued patterns have changes to the original instructions and to the sizing. Recheck sizing and fit especially with vintages. I have just started the huge task of organizing my stash of patterns, fabric and references digitally. More on that in my next post. 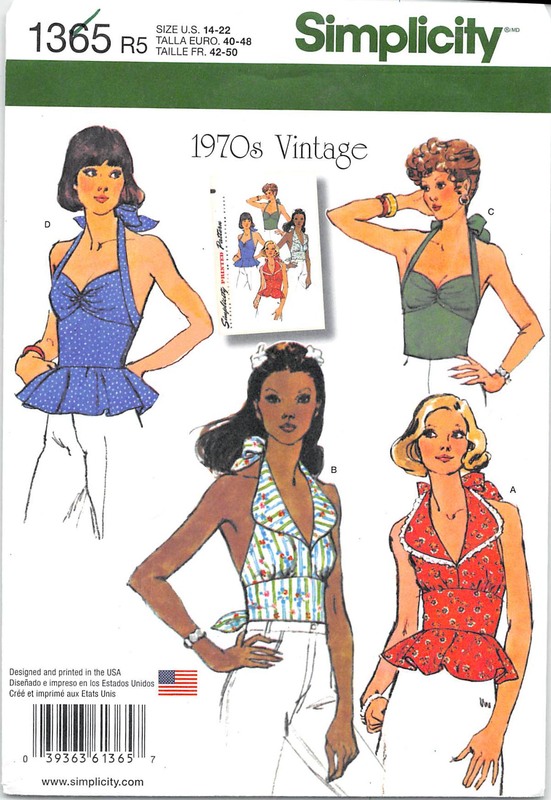 If you happen to be out and about at thrift stores or garage sales and see 1960 and 1970’s era patterns for under a $1.00, snag them for me to add to my growing collection. I have some pattern from 1970s I would like to sell. Do you have any interest or know someone who would in purchasing them?